July will be here before you know it and with it comes one of my favorite citizen science celebrations: National Moth Week! Now in its third year, National Moth Week encourages people to learn more about moths and appreciate their role in our world by making observations and participating in citizen science during the last full week of July each year, July 19-27 in 2014. Though the organizers of National Moth Week started the celebration in the US and are working toward having National Moth Week adopted as an official holiday, the event has become international with people all over the world observing, learning about, and documenting moths during one glorious week in July. Moths are amazing creatures! They are also a hugely important group of animals. 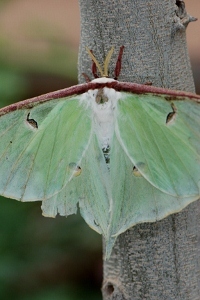 Moths are mostly herbivorous, feeding on a variety of plants and plant parts. Sometimes their plant-eating habits earn them a rightful reputation as crop, forest, or grain pests, but only a handful of the thousands of species of moths in the world are true pests. Most consume what they need without destroying the plants. Many moths play an important role in pollination, visiting flowers to sip nectar or dine on pollen and spreading pollen from plant to plant as they go. Other moths are important decomposers. You know those annoying little moths that eat holes in your favorite wool sweaters? Those are just moths doing what they are supposed to do: ridding the world of hair shed from an animal by breaking it down into soil. Moths are also a very important source of food for a wide range of animals, including birds, bats and other mammals, reptiles, amphibians, fish, and other insects. Without moths, the world would be a much less interesting place. They’re amply worthy of celebration and their own holiday! Anyone anywhere can participate in National Moth Week in a variety of ways. Perhaps the simplest way to get involved is to turn on your porch light one night during Moth Week and snapping a few photos of the moths that come to the lights. You can then submit your photos to one of a variety of citizen science projects so that scientists can benefit from your observations. Or, turn your moth night into a party! Invite a few friends over, set up some chairs around your porch light, and sit back and relax with some cold beverages and snacks as the moths fly in. 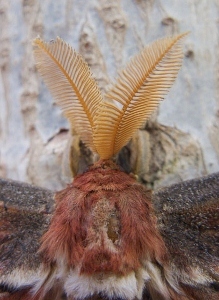 Snap a few photos of your moths and your group and share them online, either with a citizen science project (there are several recommended on the National Moth Week website) or with the Moth Week Flickr group. You can also attend a public moth night, such as the one we host at the Museum’s Prairie Ridge Ecostation. Public moth nights are often held by environmental education or nature centers and invite everyone to appreciate and learn about moths in a variety of ways. Regardless of whether you plan a private moth night in your backyard or you want to host a big public event , you should register your National Moth Week events so they show up on the map. By doing so, you’ll join thousands of other people worldwide as official participants in National Moth Week. The Museum has participated in National Moth Week from the very beginning. Our main celebration revolves around our Moths at Night program, an evening celebration of moths and moth viewing at Prairie Ridge. 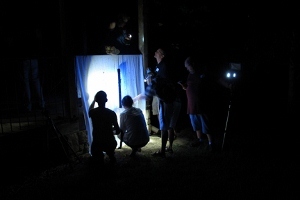 Staff from Prairie Ridge and the Arthropod Zoo set up a series of blacklight and mercury vapor light rigs to draw moths in. We also paint trees with moth bait to draw in some of the species that might prefer a tasty treat over the lure of the lights. A big part of our celebration of moths is simply watching the moths that come to our lights and baits, appreciating their amazing diversity and subtle (and sometimes not-so-subtle) beauty, though we also provide the tools to identify the moths we see, including take-home guides, field guides to use on-site, and access to Bug Guide and other online insect identification tools. We hope everyone will go home knowing how to identify at least 3 or 4 moths and with a new appreciation for how many different species there are, even in our little patch of natural habitat in the heart of the urban Triangle area. We keep a running list of all the moths we see each year and add any new species we haven’t observed already to the Prairie Ridge species list. 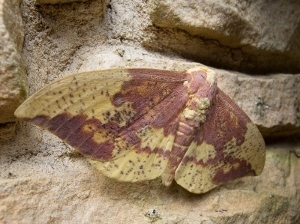 There are likely over a thousand moth species on the grounds. We’ve documented 54 so far. We can do better, and we invite you to help! Because citizen science is a huge part of National Moth Week, we encourage our Moths at Night participants to bring cameras so they can help us document the moth species that visit our lights. In the past two years, we have submitted our photos to Butterflies and Moths of North America and Discover Life. This year, we’ll submit the photos taken by staff and volunteers to our very own Natural North Carolina project and encourage our visitors to do the same. For those of you participating at home, you can help us document the distributions of the amazing moths that call North Carolina home by simply snapping a few photos and sharing them with Natural North Carolina. Get those cameras out and start shooting! National Moth Week is a great event that showcases a little understood but vitally important group of animals. We welcome everyone at Prairie Ridge on July 19th from 8pm–midnight for our annual Moths at Night celebration, full of learning and activities for moth lovers of all ages. If you can’t make it to Prairie Ridge, check out the National Moth Week event map to locate other public events in your area. Or, have a private moth night at home! There are many ways to participate, and many scientists who are interested in knowing which moths are found in YOUR area, so make plans now to get involved.